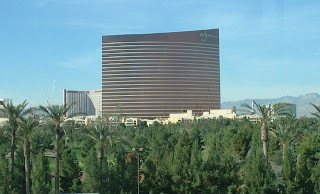 The stunning curved monolith of the Wynn rises above the Wynn Golf Course located behind the Wynn. The Wynn is often considered Las Vegas' most exclusive resort venue, offering splendid lodging, dining, and shows. Even if you stay in more modest accomodations don't miss the elegant waterfall landscaping in the front of the Wynn just off Las Vegas Boulevard, especially at the entrance that is along the walkway to the Palazzo which is across the street and just south of the Wynn along Las Vegas Boulevard aka "The Las Vegas Strip" or "The Strip". This hotel is named after Las Vegas mogul Steve Wynn, who is also the inspiration behind the Bellagio Las Vegas, the splendid Bellagio Art Gallery, and who achieved great notoriety a few years ago for accidentally mauling one of his own Picassos - a painting that he had just agreed to sell for $139,000,000.